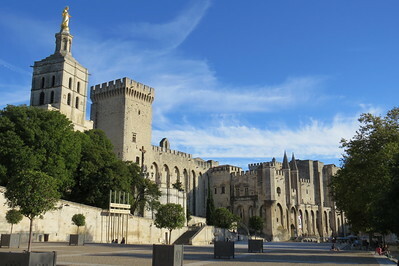 The Historic Centre of Avignon: Papal Palace, Episcopal Ensemble and Avignon Bridge comprises a group of late medieval buildings linked to the Papacy. Here the popes and antipopes lived from 1309-1432 during the Catholic schism. 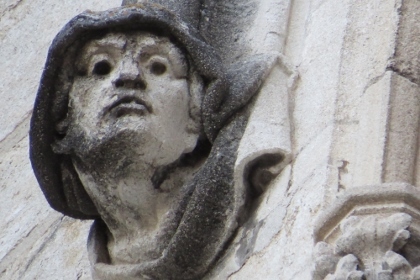 I used Avignon as a base for my 3 day visit to the Provence. A good choice, it's a bustling little city with several things to see and do. The core zone of the WHS occupies just a small area in the north of the walled city. That's where the popes and bishops built their monuments. And there also lies the Bridge of Avignon, unrelated to the papal story as far as my knowledge goes. On an early morning I spent a few EUR to walk on it - not really spectacular though the included audio guide is good. Another monument that I went into is the Petit Palais, a pretty former bishop's residence at the main square 'Place du Palais'. It's now a museum displaying late medieval French and Italian art. I liked it, though as one of the few visitors I was annoyingly being followed by the museum guards. I did not get to enter the interior of the cathedral, as it was closed any time that I tried. The Popal Palace next door obviously draws all the visitors. As other reviewers have said: most of it is empty, it looks like an empty castle. It was built during a relatively short period, and size seemed to have been more important than style or exterior decoration. Nice views are to be had from the gardens, down some stairs from the main route. 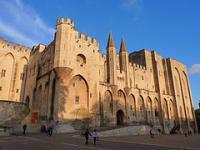 Avignon had its heyday in the 14th Century, when it was the residence of seven popes and two anti-popes. The main sight is the Gothic Palais des Papes, actually a complex of two nested palaces built around two courtyards (the large Cour d'Honneur and the cloister). The exterior is austere and repellent. With its massive walls, the towers, the machicolation and embrasures the palace looks more like a fortress. Most of the interior rooms are very large, but as other reviewer mentioned they are largely empty. The few things that can be seen: the treasury with a secret-chamber under the floor, and of course the frescoes in the Papal apartments and in two small chapels. Unfortunately it is not allowed to take pictures of the frescoes. The largest room in the palace is the dining hall, almost 50 meters in length (shows where the focus was at the papal court?). For me, the best part was the roof, with beautiful views of the Cathedral, the Place du Palais and the city center (the photo shows the view to the 'Tour de la Campagne' and the tower of the Cathedral). You can visit the palace on a self-guided tour, the audio guide was interesting and detailed (as almost everywhere on our tour to South France). The adjacent Romanesque Cathedral, Notre-Dame des Doms d'Avignon, is older than the Palace, the interior is in Gothic and Baroque style (eg the Baroque gallery). Most striking is the golden statue of the Virgin Mary from the 19th Century at the top of the tower. There are only a few steps from the Cathedral to the Rocher des Doms, today a public park. At the northern end of the Place du Palais is the Musée du Petite Palais, a collection of art of the Italian Renaissance and the Ecole d'Avignon (14th Century). A worthwhile supplement to the visit of the Palais des Papes, even for people like me who are less enthusiastic about art from this period. Also worth a look: the ornate façade of the Hotel de la Monnaie, just across from the Palais du Pape. Another part of the WHS is the Pont Saint-Bénézet, or rather its remains: four arches, a gatehouse and the two-storey chapel. 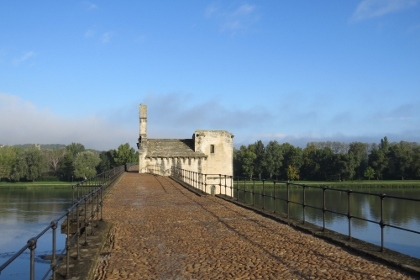 The bridge has no direct relation to the Avignon Papacy, but beautifully contributes to the panorama of Avignon which can best be admired from the Ile de la Barthelasse. You can ferry across the Rhône for free in a small boat, the landing stage is close to the bridge. 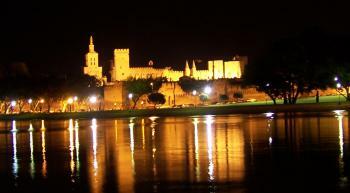 Avignon is a lively city with many bars and restaurants, ample entertainment in the evening. I liked best the atmosphere in the rue des Teinturiers, a cobbled street along a canal with some old water wheels. And a special tip: the Mon Bar in the rue Portail-Matheron, a typical French café and bar, the interior has the charm of the 1950s. There we had our first glass of red vine every evening. I visited this WHS in May 2012. The Papal Palace and bridge are the highlights of this site, however getting lost in the narrow winding streets of Avignon was equally rewarding. The food was delicious and the wine divine. The historic centre of Avignon, comprises the Cité des Papes and the bridge but also the Cathedral Notre Dame des Doms, the Jardin des Doms, the Petit Palais museum and the wall surrounding the historic centre of the town. They're all of interests but obviously, the pope's castle is the main thing to visit and offers a great testimony of the medieval french life. 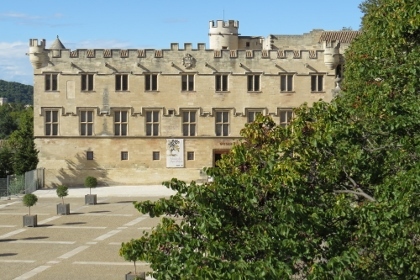 Give a look at the beautiful paintings on the ceiling of several rooms and enjoy walking on the Avignon old bridge that offers a great view of the Popes' castle. In our trip to France we have visited the beautiful city of Avignon. In 1309 the Pope Clement V left Rome and moved to the Vaclause zone, where seven years later John XXII chose this town as his residence. In 1377 Gregory XI moved back to Rome and Avignon was the residence only of other two antipopes and some Apostolic Legates; in 1791 became part of France. On a big square, created with demolishing of part of the medieval town, is the huge Popes’ Palace, a great Gothic building divided in two parts, the Old Palace of Benedict XII, that demolished the old episcopal palace where John XXII lived to built a new one, and the New Palace of Clement VI; the works for the 15165 sq. m. large building finished after twenty years of work. It has a starcaise (17th century) bringing to the gate of Champereux, that consists in two low modern towers (1932); there are are also two courts, one of which is 1800 sq. m. large and contains the remains of the Audience Chambre of the old episcopal palace, and some towers: de Trouillas (52 m high), of St. John, of St. Lawrence, des Anges, de la Gache, d'Angle, de la Campane. On the ground floor, in the Wing of the Great Dignitaries is the Great Audience Chamber, where convened the tribunal, that has two naves with big pillars and a fragment of fresco with prophets painted by Matteo Giovannetti. The Clementine Chapel, 52 m by 15 m and 19,5 m high, has a groin ogival vaulting, supported by a flying butress that spans the neighbouring street, and the original altar; the portal with nice statues is faced by the Window of the Indulgence from which the Pope gave the blessings to the crowd. In the sacristy, situated in the Tower of St. Lawrence, built under Innocent VI, is the gravestone of the tomb of Gregory VI. The Deer Room, that was the day room of Clement VI, has beautiful frescos by Giovannetti and his assistans with profane and rural scenes and of hunting. In the Pope's Room are frescos with floral motifs with trees, vines, birds and squirrels. The Tinel has barrel vaults, a nice fireplace and frescos by Giovannetti; near that are the Chamber of the Vestments, that contains four tapestries, and the chapel of St. Martial, with frescos by Giovannetti. In the Consistory Hall convened the assembly of the cardinals, foreign kings and legates and contains frescos by Simone Martini that were in the porch of the cathedral. The chapel of St. John has frescos by Giovannetti and the Camerlengo's Room has the original ceiling; near that is the Hall of Jesus and the Treasury. The Cathedral of Notre-Dame-des-Doms in Romanesque style (12th century) and his complex of episcopal buildings were replaced in the 15th and 17th century by the present building. The east tower was destroyed in 1405 during the siege of the town by the antipope Benedict XIII and reconstructed. The cloister was destructed because of the demolition and reconstruction in an enlarged form of the apse. The façade has a porch with classical columns and a gilt statue of the Virgin (1859). The building has a nave with lateral Gothic chapels, tribunes and a Romanesque dome and contains the episcopal chair, the tombs of John XXII and of Benedict XII, statues and the treasure. The Small Palace, built in the 14th century after the demolition of medieval houses as a cardinal's residence, acquired by John XXII to compensate the Bishop for the demolition of his palace to permit the construction of the Pope's Palace and reconstructed in the 14th and 15th centuries, has a nice room with frescos and a nice fireplace. The big gardens Rocher des Doms are situated on a high rock where begin the ramparts, built in the 14th century to defend the town and separate it from the river, strengthened and reconstructed also by Viollet-le-Duc in the 19th century, with a lot of towers, like the octagonal tower des Chiens (15th century) and the tower of Châtelet, that gives access to the famous Saint-Bénézet bridge. It was constructed on stone piers of a Roman bridge in the 13th century to replace a wooden bridge, destroyed in 1226 in a French siege during the Albigensian crusade, and to go over the river Rhone to Villeneuve-lès-Avignon and only 4 arches of 22 remain of it because it fell down after the opening of the vents in 1562. On the second pier is constructed the Romanesque chapel of St. Nicolas, with two floors and a polygonal apse constructed in the 15th century. Avignone is one of the most beautiful places I have ever seen because of its high degree of impresiveness and quality. It's absolutely worth to be visited and justifies the inscription also because of its historical importance, but I think that could be inscribed with the nearby second papal town of Villeneuve-lés-Avignon. Avignon was a fantastic place, where we spent the best part of a week in late September, enjoying the city and travelling to the cluster of WHS within easy travelling distance of it. The main sights here are in a cluster at the northern end of town. The main sight is Palace des Papes; despite being mostly empty I really enjoyed taking the audio tour around here. One year before I had visited the Vatican and it was great to be able to contrast the two, and basically see what the Vatican would have been like if it was built in a Gothic style. There is a wine tasting exhibit as you exit and I can thoroughly recommend this as it is a great and fairly cheap introduction to the wines of the Rhone region, there are very few places better to drink Château-Neuf-Du-Pape, than in le Château-Vieux-Du-Pape. A walk around the outside of the complex will reveal how massive the complex is. It will also take you to the great gardens, which offer fantastic views of the Rhone. The Cathedral and Petit Palace are situated on the same square as the Palace, and are worth the time to explore. The other major part of the inscription lies just outside the city walls; this is the famous Pont St Benezet/ Pont de Avignon. This is half a bridge with a little chapel on it; I must admit we didn’t pay to go on the bridge instead we preferred to view it for free from the banks of the Rhone. Just up stream from the bridge there is a free boat to take you back and forth to Ile de la Barthelesse, which offers the best view of the whole ensemble (picture), also great budget accommodation. The rest of the city inside the impressive looking walls is a really lovely place to stroll around and lose yourself. The city seems to be chock full of bars and restaurants, the ones on Place d’Horlage cater mostly to tourists, however the charming rue des Teinturiers has some fantastic restaurants and a great atmosphere. I can give a huge personal recommendation to Wollomoooloo, which was one of the best dinning experinces i have had, the food at l’Orangerie on Place Jerusalem was also fantastic. 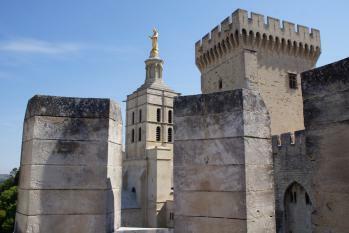 Avignon is a great place to base yourself for viewing Provence, including 3 other WHS. It has great transport connections with its brand new TGV station just out of town, with regular services to Paris, Lyon etc. and once a week to London! We had a fantastic time here, and there is plenty to see and do. A very fine World Heritage Site. From "Historic Centre of Avignon" to "Historic Centre of Avignon: Papal Palace, Episcopal Ensemble and Avignon Bridge"
Notable Bridges: Pont Saint-Bénézet, medieval bridge commemorated in the song "Sur le pont d'Avignon"
Prison: During the French Revolution, the church was heavily damaged, and the cathedral turned into a prison. Salt: At the foot of the bridge there used to be a salt store. It was located on a salt trade route. Cadaver tombs: At the Petit Palais - Cardinal Jean de La Grange "This transi is one of the earliest examples of the macabre genre current in Northern Europee at the end of the Middle Age"
396 Community Members have visited.